Just a hop away from Washington, D.C. is, of course, Virginia. Though we Socks worked between D.C. and Arlington, we lived in Rosslyn, just across the Potomac from the nation’s capital, only one metro stop away, in fact. We wouldn’t exactly call Rosslyn a suburb of D.C. It has its own character, a melting pot of sorts. The best part about it was all the different ethnic restaurants – Indian, Italian, French, Southern Barbecue, Greek…and the list goes on. Stacy Lyn and her daughter Jillian tried them all! One evening Stacy Lyn invited a friend over for a seafood gumbo supper. This may not seem like a momentous occasion, but Stacy Lyn hadn’t invited anyone to her home in Louisiana since rebuilding it after Katrina. She was so overwhelmed by the loss of community that she felt. Though the houses were reconstructed, the community was gone for a long time. So when Stacy Lyn’s friend came over to her home in Rosslyn, we Socks were happy that Stacy Lyn had taken the first step in rebuilding community in her life. Another day, Stacy Lyn branched out a little further by taking a walk to Georgetown, Virginia. It was a very picturesque town on the river, bustling with shoppers, bicyclists, and tourists, but we preferred the quietude of Rosslyn. Here we are on the steps where a scene in The Exorcist was filmed. Stacy Lyn looks frightened because she thinks she saw a ghost. Can you believe that – after this – we crossed the Atlantic Ocean and the Mediterranean Sea to get to West Africa? 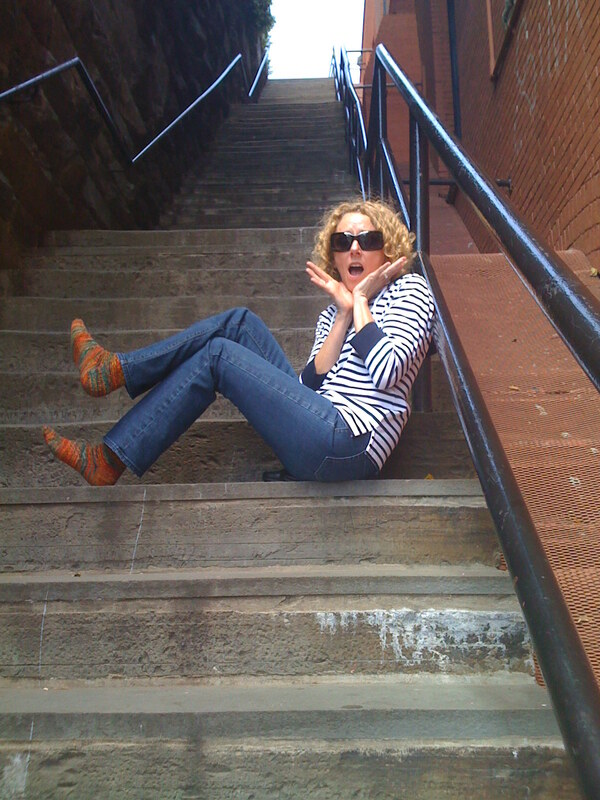 And Stacy Lyn thought the Exorcist Steps were scary!